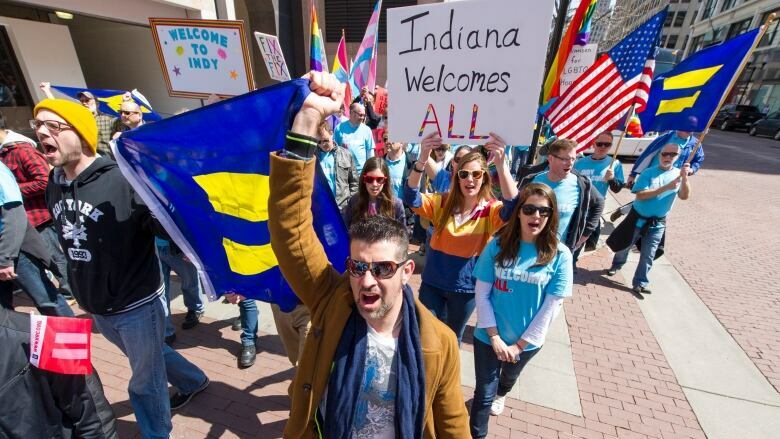 Hundreds of people calling for Indiana to add protections for gays and lesbians to the state's civil-rights laws marched through downtown Indianapolis Saturday, attracting the attention basketball fans attending the NCAA Final Four. "This new language that they've added is like stabbing somebody in the back and then pulling it out three inches and saying, 'You're all right, right? We're good now, right?'" he told crowd, which shouted back "no!" Dorsey then led the gathering in chanting "Hoosiers don't discriminate! — No more Band-Aids masking hate!" as they began a march that carried them several blocks past the city's business district, bars and restaurants to the Lucas Oil Stadium, home of this year's men's Final Four. Dozens of the marchers carried rainbow flags, American flags and Indiana state flags as well as signs reading "No hate in our state," "Equal rights for all" and other messages. Some pushed baby strollers with their children, others had dogs on leashes and many wore blue T-shirts reading "Indy Welcomes All." Police officers who blocked intersections so the protesters could march along downtown streets without incident estimated that between 500 and 600 people took part in the march. There were no arrests and the protest was "very peaceful," said Indianapolis police spokesman Lt. Richard Riddle. A crowdfunding campaign for Memories Pizza in Walkerton, Ind., which came under fire after its owners said their religious beliefs wouldn't allow them to cater a gay wedding, has raised more than $840,000. In North Dakota, Republican Gov. Jack Dalrymple rebuked the Republican-controlled legislature after it voted down a measure that would have prohibited discrimination based on a person's sexual orientation in the areas of housing and employment. In Michigan, Republican Gov. Rick Snyder warned legislators that he would veto a religious objections bill unless they also sent him a measure that would extend anti-discrimination protections to gays. He cited the Indiana outcry in making his warning.